There are many opportunities within the dairy industry both on and off the farm. Farm work is outdoors, with animals and the variety means every day is different. Dairy farms can be great places to work. Get this right and you will make a great start in the job and could really go places. New to the dairy industry or need to update your CV? Find out how to create the right CV and get ahead of other job applicants. Finding a job in the dairy industry is about matching your personality, your skill set, career goals and non-negotiables with the right employer. New to the farming industry, landed an interview or need to refresh your interview skills? Find out what and how to prepare for that all important job interview. What is a fair pay rate? What is the accommodation situation and what are the job benefits? Find out what you can expect and how to negotiate a good total package. It’s important to know about your prospective employer so you can be happy in their workplace. How can you find out about your future employer? The industry-agreed dairy farm role descriptions (DISR) creates clear and consistent role expectations. For more resources and information check out Careers New Zealand. Where employers list jobs on the Fonterra website and commonly used by famers. Check out Farm Source jobs (formally Fencepost). 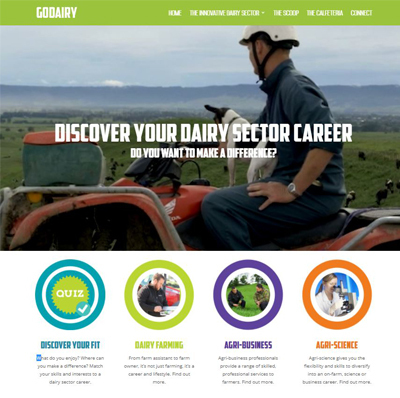 Is a career in dairy farming, agri-business or agri-science your future?